early 1978? | age 9/10 Cor, get a load of Princess Leia in this one—gorgeous. Or maybe not. Odd dialogue in this one but Solo’s sideways glance is pretty good. I’m surprised I could manage such subtlety at that age, and convey the sense of what’s really going on here. So Leia’s a bit haughty looking but condescends to say “Hello” to the peasant (Solo), who seems to be ignoring her. Solo gives that nice momentary, disinterested, teeth bared, sideways glance at her in mid-conversation with Luke. A very important conversation! He says, “Yeah, hi” through the side of his mouth. 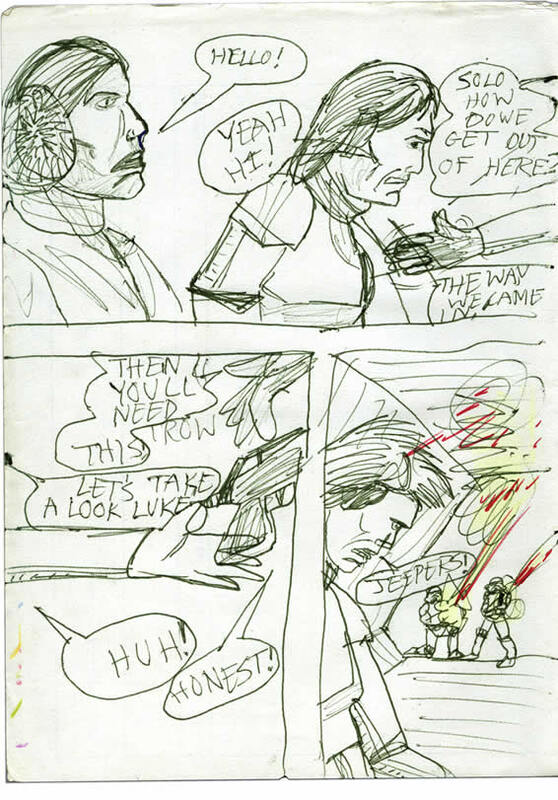 Luke’s thumb gestures back at something—and we get some funny Beano comic style visual assistance. Do you see the dashed line? I’m not sure what it’s suppose to mean! It’d be nice to say that the jumble of speech bubbles here is meant to mirror the confusion of the moment—but you probably know SWa9 as well as I do by now, readers! “Trow” – looks like Throw pronounced in an Irish accent! I’d been in Ireland a year or so at this point. Jeepers! Where’s me feckin’ tractor? A similar school. That pukey oak smell. Or was it? Speaking of religion… when I arrived in the smelly little village school here; the kids, knowing I was English, were curious to know what denomination I was. At some point on day one, I said “atheist.” I was so certain, at only 9 years old. Or, I was just copying my dad, and maybe even trying to shock and feel superior. I got some real stick after that. I was something very weird indeed! The Force wasn’t a religious option then, as the movie wouldn’t impact Ireland for about 4 months. However, in the last Irish census a huge number people wrote JEDI under ‘religious belief’. Wee Ireland’s changed – quite a bit!